by Dr. Fayez Rasheed :Palestinian prisoners experience had conditions inside Israeli jails as they are kept in crowded and difficult conditions and face a lack of adequate nutrition and poor medical treatment. In a press conference at the Public Security Ministry headquarters in occupied Jerusalem a few days ago, Minister Gilad Erdan announced that he would be imposing further punitive measures on Palestinian prisoners. These include separating Fatah and Hamas prisoners from each other, dismantling factional blocs within prisons and abolishing the independence afforded to them before redistributing and mixing such prisoners. Erdan also decided to abolish the position of prisoner spokesman, banned personal cooking, lowered the amount of money allowed for buying food and drink from the canteen, and completely cancelled any cash deposits from the Palestinian Authority indefinitely. According to Yedioth Ahronoth, Erdan said that a state of deterrence and counter-terrorism must be established, and this must continue inside prison as well as outside. Nearly 7,000 Palestinian prisoners, including women, the elderly and children, are suffering in Israeli prisons. Many of them are serving life sentences; some have been behind bars for over 30 years. The Palestinian prisoners’ battle focuses mainly on improving the harsh conditions of their detention, which are intended to kill them slowly, physically and psychologically. Palestinian prisoners are kept in crowded and difficult conditions and face a lack of adequate nutrition and poor medical treatment (or none at all); they do not have access to books and cannot listen to anything other than Israeli news on the radio, while watching television is banned. Moreover, new medicines are tested on prisoners which, when combined with the difficult living conditions, lead to many prisoners developing chronic diseases and permanent disabilities. Family visits are often blocked altogether or cancelled at random. When they are allowed, the prison authorities use barbed wire barriers to keep prisoners and their relatives at least one metre apart. One of the most dangerous Israeli practices against Palestinian prisoners is the psychological torture of being held under administrative detention with neither charge nor trial. This form of detention is renewable and thus can last for many years, with no family visits for months on end. Chronic mental illnesses have often resulted. Recent statistics reveal that more than 1 million Palestinians in the occupied territories have been detained by Israel at one time or another. This means that, on average, at least one member of every Palestinian family has been arrested and imprisoned. Since 1967, when the Israeli occupation of the West Bank and Gaza Strip began, 218 Palestinian prisoners have been killed in Israel’s prisons: 75 were killed as a result of premeditated murder, 7 were shot and killed, 62 were killed due to medical negligence, and 73 prisoners were tortured to death. Female prisoners arrested while pregnant must give birth under harsh conditions in a “hospital” room within the prison supervised by a nurse. Some have been handcuffed to the bed while giving birth. Babies stay in prison with their mother. These are the sort of living conditions endured by Palestinian prisoners in Israeli prisons, which resemble concentration camps in a number of ways. 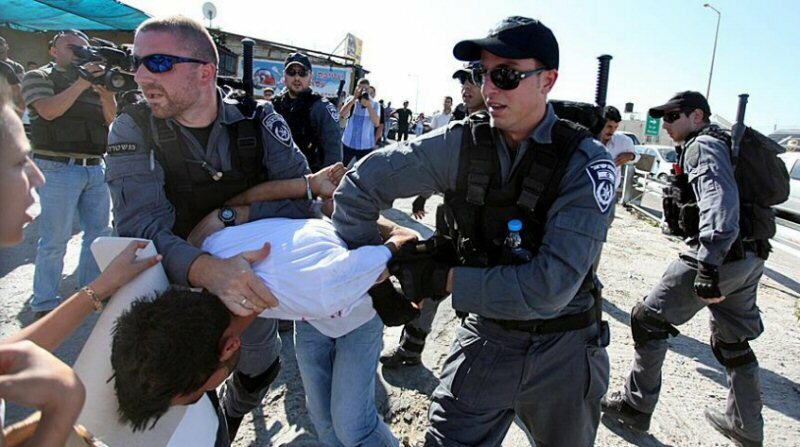 Israel imposes collective punishment on the prisoners, and the prison authorities have used border guards on countless occasions to attack them with live ammunition, tear gas and other weapons, simply because the prisoners have asked for better conditions. It is odd that Israel not only promotes itself as a democracy, but also that the rest of the world believes it. The international community has more or less overlooked the issue of Palestinian prisoners held by Israel. Nevertheless, despite Israel’s oppression and neo-fascist policies, Palestinian prisoners have managed to turn their cells into learning centres which help to develop prisoners’ political awareness and loyalty to their people and their national cause. Prisoners thus begin to understand and believe in the complete justice of their cause, and increase their determination to achieve the Palestinian goals of freedom, dignity, return and the establishment of an independent sovereign state of Palestine. Furthermore, the Palestinian political split is put aside in prison, with detainees sharing the desire to achieve national unity among all Palestinian organisations. They are also united in trying to thwart Israeli plans to break their will. From time to time, Palestinian prisoners resort to the only weapon at their disposal and go on hunger strike. If they were anything other than Palestinians — Jews, for example, or Americans — their hunger strikes would garner support around the world and probably be discussed in international forums, including the UN Security Council. But they are Palestinians, and so double standards apply. The issue of Palestinian prisoners held by Israel must become a cause for every Palestinian in the world, as well as the Arab and Muslim states; their cause must be highlighted and fought for at the highest levels across the international arena. We must struggle to make Israel’s treatment of Palestinian prisoners an international cause célèbre. That is the least that we can do for them.